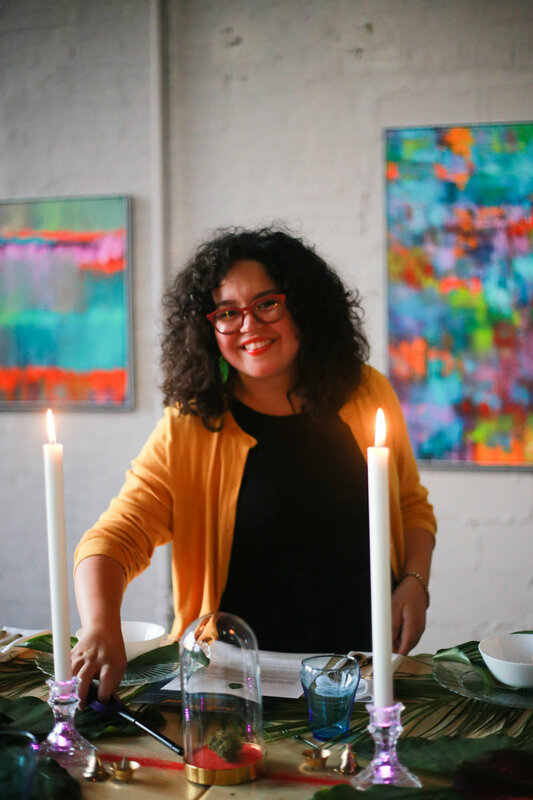 Michelle Ivette Gomez of Creative Unions Event Design. Photo by Fluffy Pop Postcards @fluffypoppostcards. Hey art lovers and cannabis enthusiasts, happy 4/20! Considering that this grassroots holiday is rooted in community and spreading love, I thought it was the perfect occasion to tell you about my most recent Creative Union that was all about camaraderie, community, and self love. 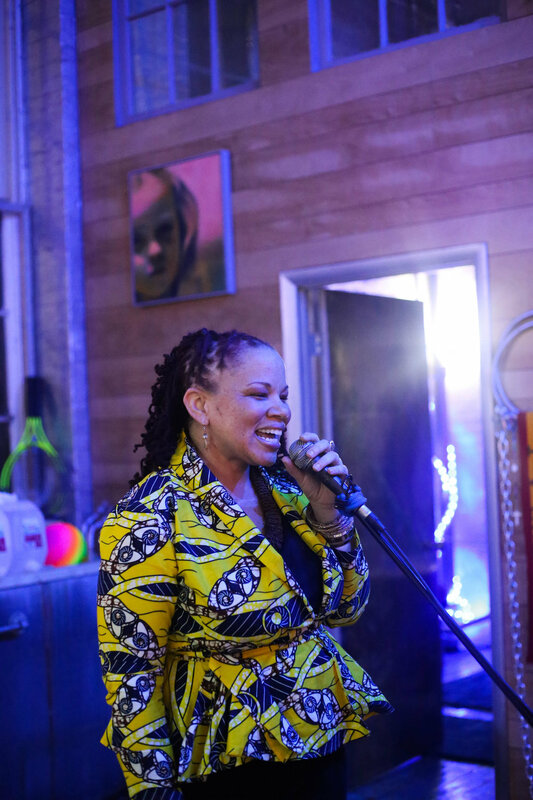 I helped celebrate my good friendor Megon Dee-Cave (@chefmegondeecave) and her infusing talents as a pioneering woman in the cannabis industry! 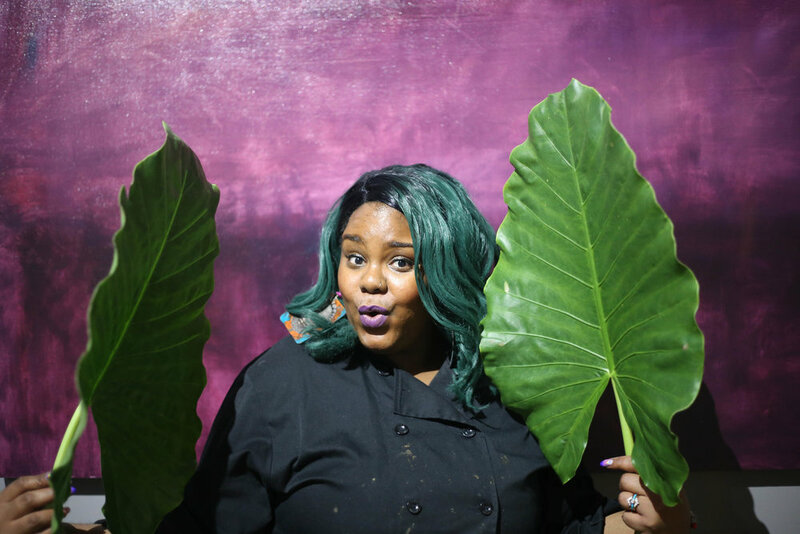 Although no one got married, this Creative Union celebrated Megon’s love for cannabis as she formally introduced herself as ORACLE of Oracle Infused, the alter ego to Chef Megon. Check out the photos and recap below, all these beautiful photos were taken by Fluffy Pop Postcards! Afterwards, you will learn ways to incorporate cannabis into your Creative Union! The lovely Chef Megon Dee-Cave who hailed all the way to Baltimore, MD from Portland, OG in front of David Herman's artwork. Photos by Fluffy Pop Postcards @fluffypoppostcards. 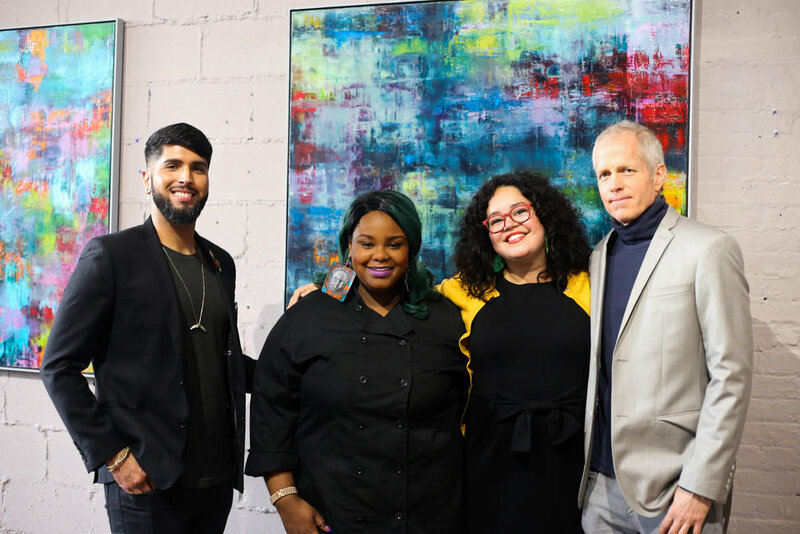 I had the pleasure of curating an art exhibition entitled Beneath the Surface by David Herman for this unique pop up experience and cannabis infused dinner presented by ORACLE, of Oracle Infused—the alter ego of Chef Megon-Dee Cave. 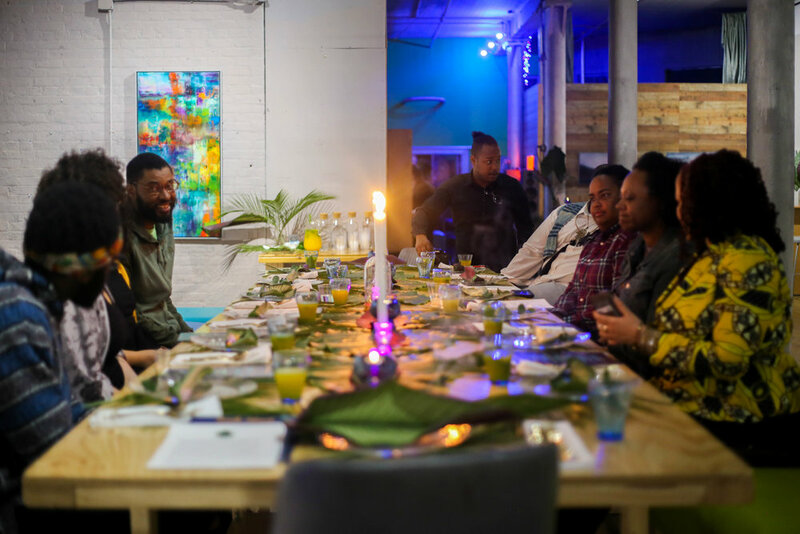 This small and intimate Black Panther inspired dinner styled by Joseph Faura of Fifth House Events Collective brought strangers closer to each other in a specially curated experience where art, cannabis, and sound came together to transport our guests to a metaphorical Wakanda at Grey Matter Art Space in Baltimore, MD. My friendors from left to right: Joseph Faura of Fifth House Events Collective, Chef Megon Dee-Cave of Oracle Infused, Michelle Ivette Gomez of Creative Unions Event Design, Artist David Hernam of Grey Matter Art Space. Photo by Fluffy Pop Postcards @fluffypoppostcards. Utilizing purple and blue colors from Black Panther’s Wakanda and David Hernam’s paintings, Creative Unions Event Design X Fifth House Events Collective combined gold flatware, blue glassware, blue candle votives, and magenta lit clear candle holders for warm, glowing, and intimate lighting. 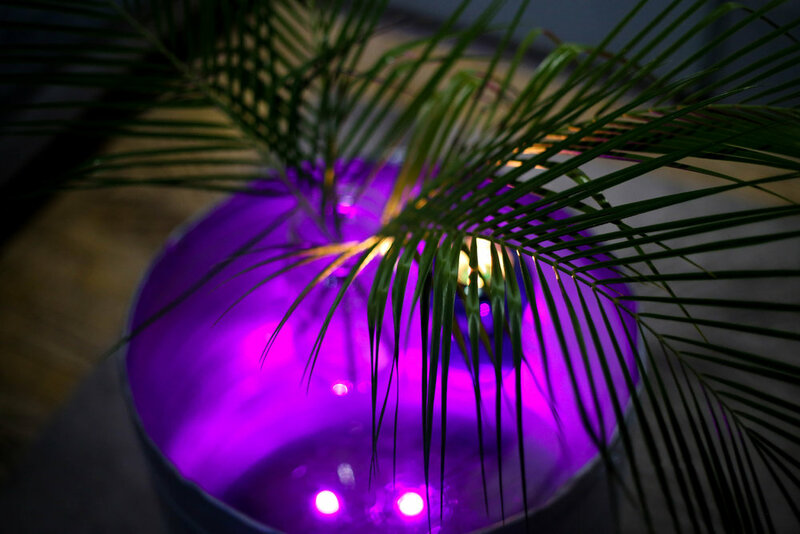 The lighting was inspired by Wakanda’s purple-blue florals that provide the Black Panther with vibranium and strength. 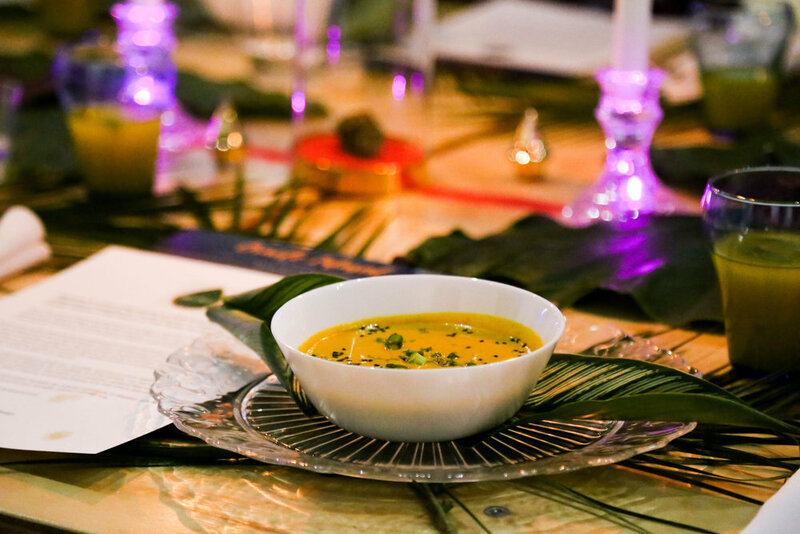 The luscious tropical green leaves from B. Willow connected guests to nature with green & purple foliage and ferns throughout the event, alongside gold hand lettered seating assignments on small green leaves placed on the dinner table. An ephemeral lines of red sand ran across the dinner table and around the lounge to connect us to our ancestors and bloodlines. The red line of sand met at the center of the table, where a bud was placed within a glass centerpiece. 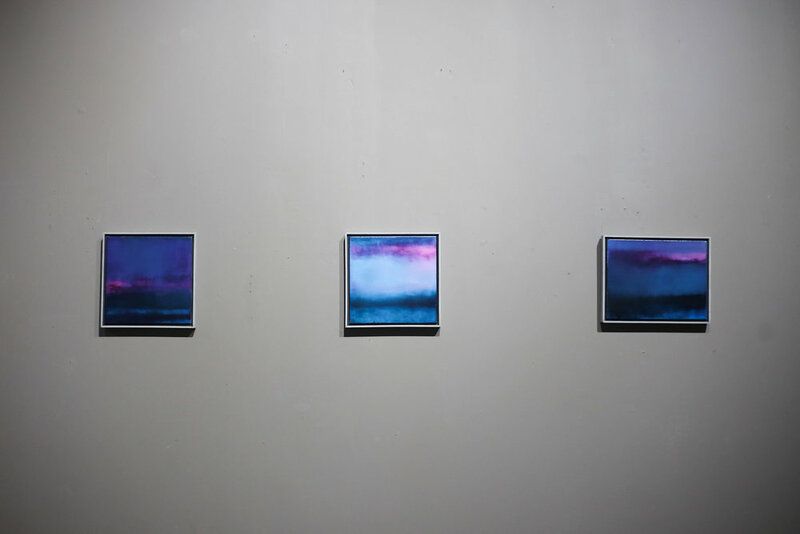 Beneath the Surface featured the lush green-purple abstract underpaintings, landscapes, abstract paintings and ambient sound art of David Herman. While underpaintings are traditionally seen as the beginnings of a painting in progress, Herman explores the atmoshpere and colors of his underpainting as finished artworks to shine light on the emotions beneath the surface of our egos. By activating all of the senses in this dinner through art, sound, deep conversation, and great food, we were able to experience a safe and comfortable high that allowed us to go beneath our surfaces, experience meaningful and connected relationships, and absorb a deeper capacity to love artwork, love others, and love ourselves. At the end of the evening, we enjoyed a spontaneous jam session in David's music studio, and we all got swag bags with goodies provided by our sponsors: Oracle Infused, Charm City Medicus, and Power Decals! We even had our nails done with my friendor Charlotte James of Power Decals (with weed inspired nail decal artworks)! This experience proved that with visual art and cannabis infused culinary arts, we can thrive as a collective whole beneath the cultural constraints of Western culture and the individualistic ego, allowing us to heal and become the highest version of ourselves (literally)! I cannot wait to collaborate with Oracle Infused and Fifth House Events Collective on another pop up dinner, stay tuned! And yes, Creative Unions are not just limited to marriage celebrations, but other life celebrations like this one! 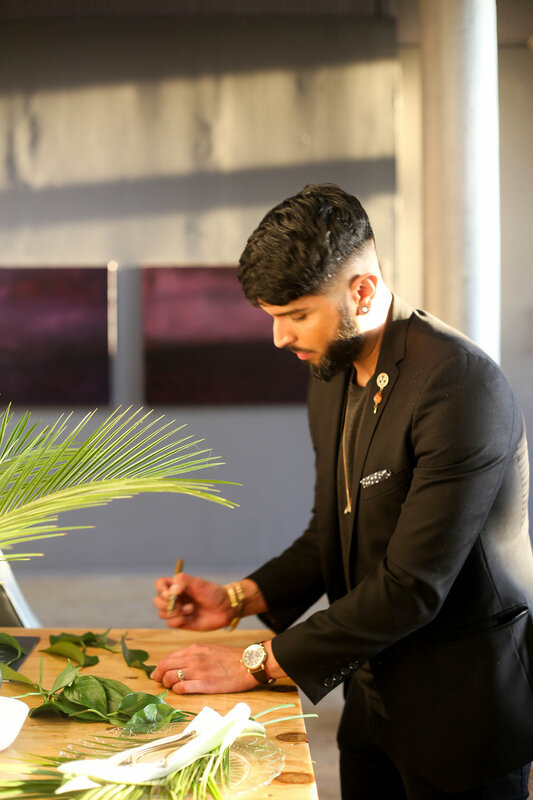 Read below to hear from Cannabis Chef Megon Dee-Cave of Oracle Infused on how you can incorporate cannabis into your wedding! 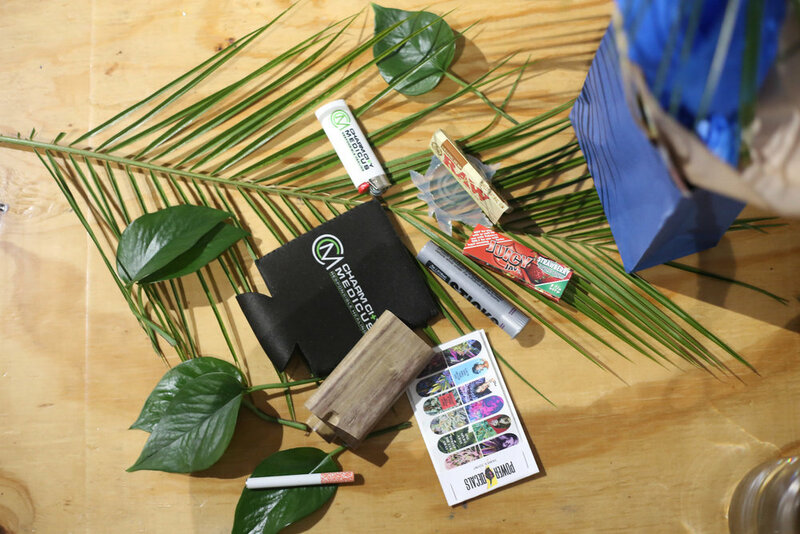 With so many available products containing cannabis, gifting a cannabis infused memento has never been easier. 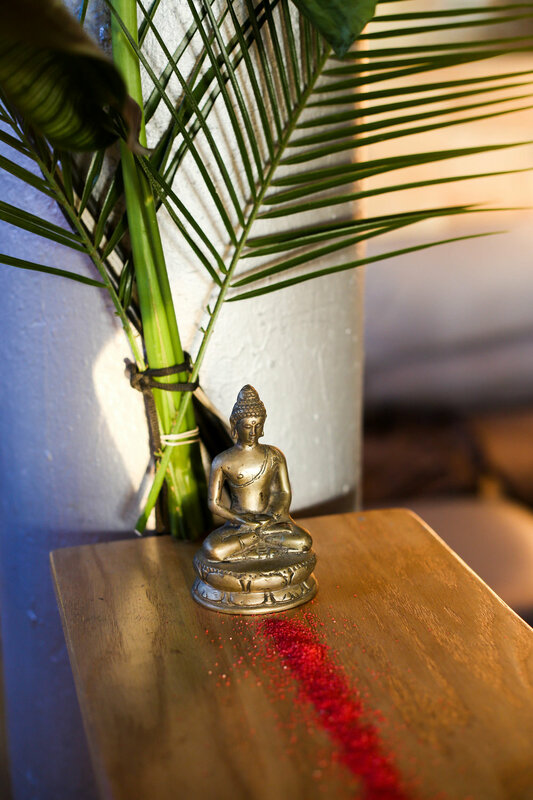 From edibles, to pre-roll joints, bath bombs, body salves and CBD everything, you can unobtrusively encourage your guest to imbibe at their own pace and celebrate your Union, after the party! Be sure to personalize it with some art to add that special touch. 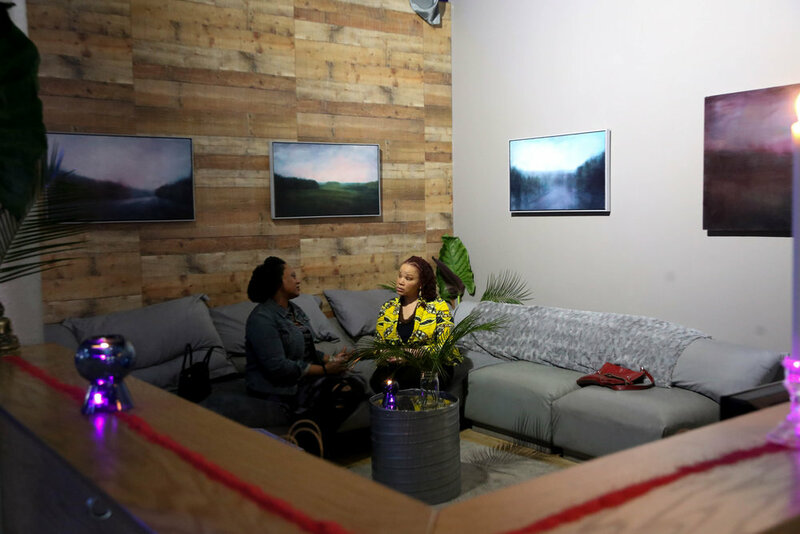 From: A plant inspired pop-up experience and art exhibition presented by Oracle Infused in collaboration with Creative Unions X Fifth House at Grey Matter Art Space (Baltimore, MD). Photo by Fluffy Pop Postcards @fluffypoppostcards. PARTY ON! Introduce the concept of cannabis consumption through ingesting as opposed to inhalation. 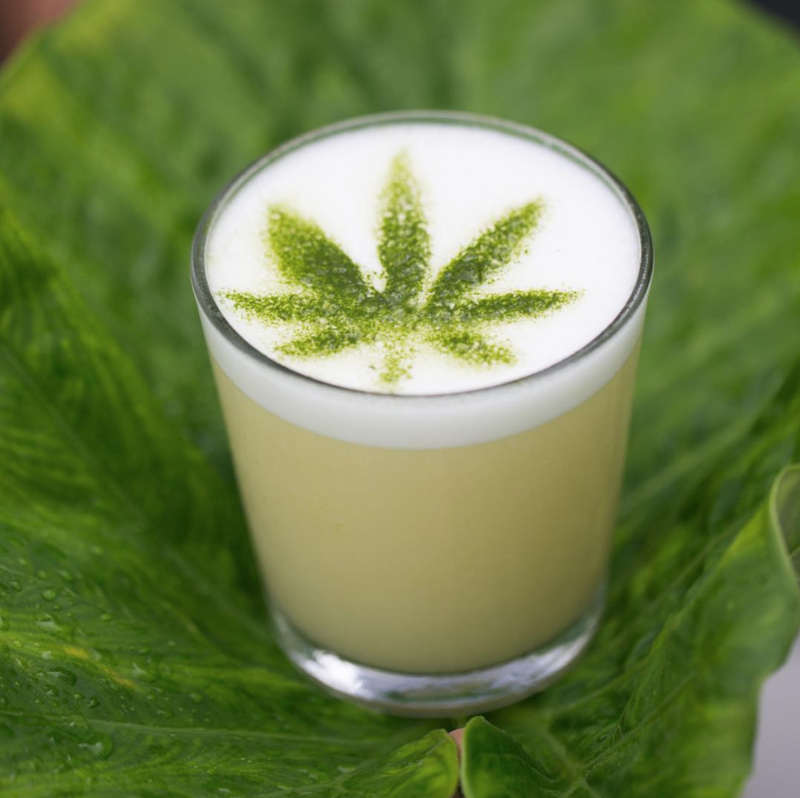 Cannabis-infused “mocktails” in place of alcohol will be gentler on your guests providing no hang-over when consumed in moderation. Easily make any beverage infused with a cannabis tincture or CBD powder. Infusing with 1:1 part THC and part CBD, allows for guests to experience a psycho-active experience while feeling in control and balanced. An ideal microdosing for a consumer ranges from 2.5-5 mg of THC/CBD. Given that everyone has their own unique ECS – Endocannabinoid System, your guest will experience cannabis differently. Image from: Plant Miami @plantmiami. Offering guests a cannabis infused accent sauce is a sweet and discreet way to provide a lifted element to your special day. Try a cannabis infused chipotle caramel-chocolate ganache, guava lime syrup, or lavender lemon curd on your wedding cake. Image from OffBeat Bride: "A stunning Jamaican wedding shoot with a ganja rolling station"
Imagine…HIS and HER ∣ HIS and HIS ∣ THEIRS and THEIRS ∣ HERS and HERS signature cannabis bud bars highlighting your individual favorite strains. 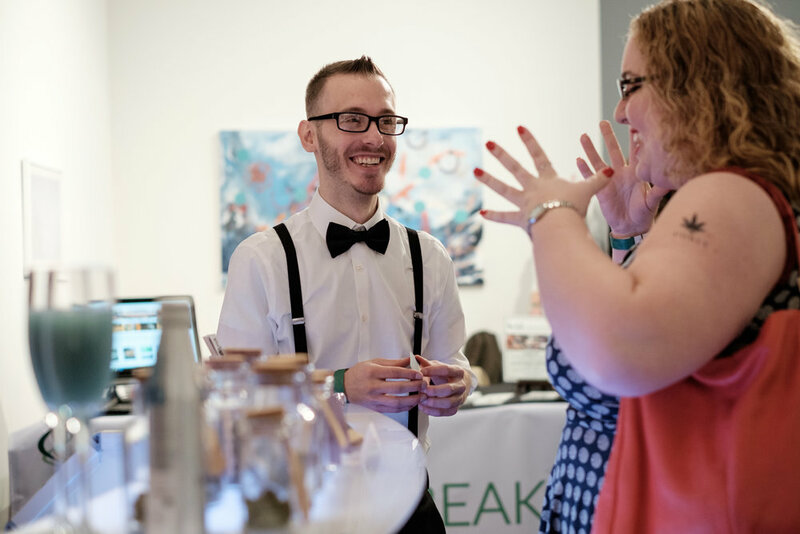 Hire a budtender to help ensure that your guests will gain cannabis knowledge and experience cannabis in a fun way while responsibly consuming. A professional budtender can educate and entertain while serving you and your guests. Just imagine...artist made Bong vase centerpieces, hanging Purple Hindu Kush air plant glass displays, Silver Haze bud laced bridal bouquets, Blue Dream boutonnieres, or an updo or side ponytail hairstyle adorned with cannabis fan leaves. 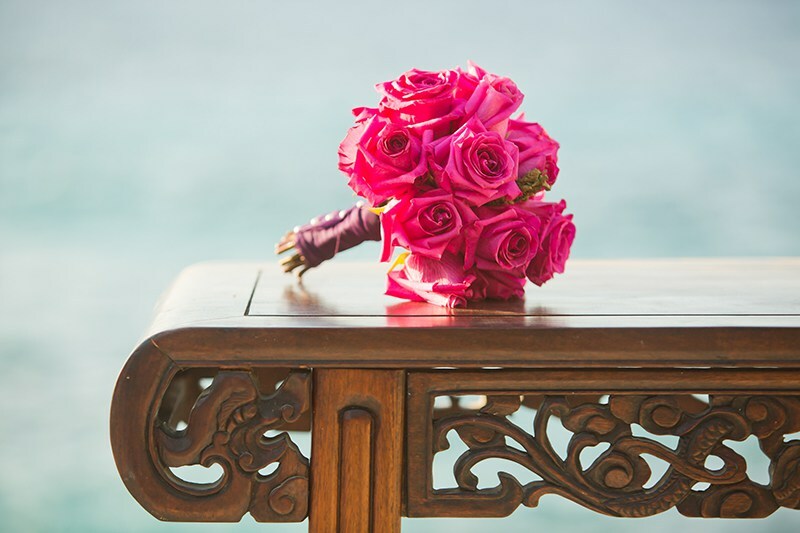 Placement of various plant parts can be aesthetically pleasing for all your wedding décor. Contact a dispensary or cannabis farmer for more information on how go about buying in bulk for décor purposes.